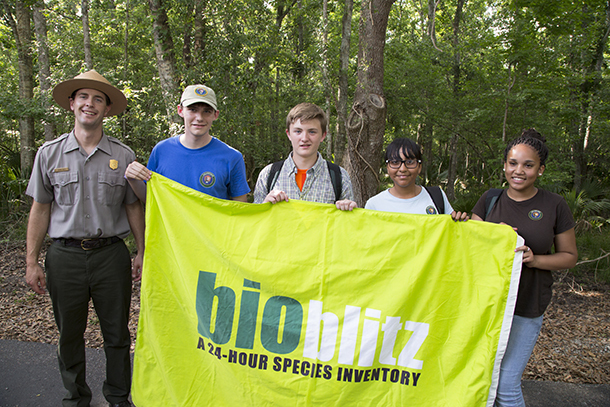 From left to right: Aaron Roth, Deputy Superintendent of Golden Gate National Recreation Area, and National Park Service Biodiversity Youth Ambassadors Caleb Ezelle, Parker Hopkins, Valyssa Flores, and Dara Reyes at the 2013 BioBlitz at Jean Lafitte National Historical Park and Preserve. Photo by Christopher Sims. The mission of the National Park Service Biodiversity Youth Ambassador Program is to cultivate youth leadership that inspires next generation environmental stewards in our schools and communities. The E.O. Wilson Biodiversity Foundation is actively participating in the strategic development and success of the National Park Service Biodiversity Youth Ambassador Program through our Collaborative Storytelling Project (Inspired by Nature), through participation in the National Park Service/National Geographic annual BioBlitz program, and through our support of Youth Ambassador social media networks. The Foundation has provided stewardship for the Youth Ambassador program by 1) working with Duke’s Nicholas School of the Environment Masters of Environmental Management graduate students to help create a strategic and administrative handbook for the program, and 2) through sponsorship of a University of North Carolina–Chapel Hill undergraduate intern, who provided guidance and mentorship to the Youth Ambassadors. BioBlitz 2014, held at the Golden Gate National Recreation Area in San Francisco and attended by the National Park Service Biodiversity Youth Ambassadors, was featured on CBS Sunday Morning. During BioBlitz 2014, staff from the E.O. Wilson Biodiversity Foundation gathered stories from students who shared their transformative moments of discovery. The National Park Service (NPS) and National Geographic Society are collaborating to conduct a large-scale BioBlitz in a different national park each year during the decade leading up to NPS Centennial in 2016. The National Park Service (NPS) and the E.O. Wilson Biodiversity Foundation work together to promote the excitement of discovery and to support the work of NPS Biodiversity Youth Ambassadors.